Bosch coffee machines are easy to use and easy to clean, and they always deliver the perfect cup of coffee, just the way you like it. 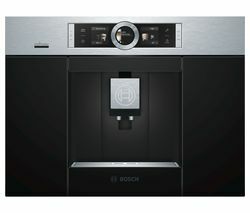 When you choose a Bosch coffee machine, you’ll save money on expensive coffee shop drinks without sacrificing on taste. If your morning coffee routine needs a shake up, try a Bosch coffee machine in your kitchen and see how easy it is to produce steaming hot cups of coffee without any fuss. If you plan on having a dinner party, your guests will be impressed with the barista style drinks you serve if you have a Bosch coffee machine at your disposal. Bosch coffee machines can make other hot drinks too, so you’re not limited to coffee. Simply pop in a pod of your selected beverage and you’ll get a piping hot cup at the touch of a button. There are a huge variety of different drinks and flavours available for each Bosch coffee machine, so you won’t be stuck for choice. And because each Bosch coffee machine is fully programmable, you get the perfect hot drink every time. If you can’t find a Bosch coffee machine you like, take a look at our range of Delonghi Coffee Machines and if you’re after a more luxurious option, try a Nespresso Coffee Machine. If you enjoy the smooth taste of coffee, but you don’t want to resort to using a complicated espresso maker, a Bosch coffee machine is ideal.